Mites are a common problem with chickens. 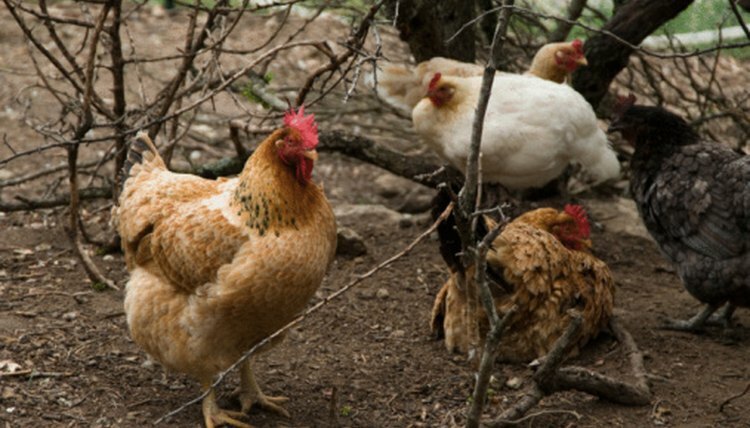 Dealing with a mite infestation is something most chicken owners face at some point. The key to getting rid of an infestation is to clean and treat the chicken coop rather than the birds. There are many commercial pesticides on the market for dealing with mites, but there are also several natural ways to kill the infestation and keep it from reoccurring. Cleaning out the coop is the first step in getting rid of mites. Mites live in bedding, food dishes, and corners or cracks in the coop. If you don’t clean and treat the coop, the chickens continue to catch mites from the environment. Muck out feces, and throw out all the bedding. Discard food and water, and clean the dishes with a mixture of vinegar and water. It's also effective to power wash the inside of the chicken boxes and the coop to clear out any mites and their eggs. Neem seed oil, which is available at most gardening centers, kills mites by disturbing their life cycle. Neem oil is natural, and comes from the seeds of an evergreen tree. Using a sprayer, mist a mixture of neem seed oil and water onto chickens and their boxes. Neem is powerful, so use 2 tbsp. of neem oil per 1 gallon of water to create the spray. Diatomaceous earth is a special type of dirt that is full of sharp edges that pierce and kill small pests like mites. It is harmless to humans and animals, and doesn’t contain any pesticides or chemicals. Spread the diatomaceous earth around the coop and then vacuum or sweep it up. Also rub the earth into the feathers of infested chickens to kill the mites. A number of herbal insecticides are used on chickens, including tea tree oil, citronella, garlic, soybean oil, peppermint, lemongrass, eucalyptus and cedar wood oils. Chickens are bathed with soap containing these oils, or treated with a spray containing the oils mixed with water. The oils are very concentrated, so the sprays contain only 1 to 2 percent oil. The feet and legs of chickens are rubbed with soybean oil, linseed oil or any type of vegetable oil to help with scaly mites. Vaseline is also used to treat scaly leg mites. Spread Vaseline onto the chicken’s legs and feet. The jelly suffocates the mites and soothes the aggravated skin. Vaseline is spread into corners and cracks as a sort of sealant to suffocate live mites, and keep new ones from entering the chicken coop. Once the mites have been killed, there are several natural ways to try and keep them from returning. The same herbal sprays made to kill the mites are used on the birds and their bedding to keep mites away. Eucalyptus or lemongrass leaves are crushed and placed in the chickens’ normal bedding. Another herbal deterrent is crushed garlic in the chickens’ drinking water; mites do not like the scent or taste of garlic.